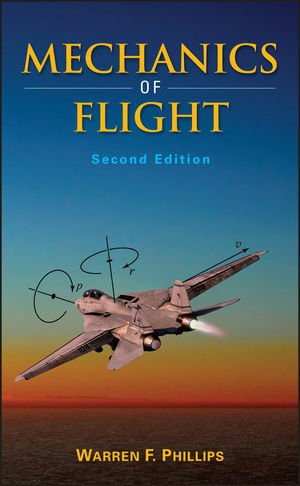 With its unique balance of breadth and depth, coupled with a comprehensive presentation of theory and applications, Mechanics of Flight is rapidly becoming the textbook of choice to enable readers to master the science and mathematics of flight mechanics. By progressively building on the formulation and solution of simpler problems associated with aircraft performance, static stability, and control, the author guides readers from fundamental principles to the development of the general equations of motion and continues through dynamic stability, aircraft handling qualities, and flight simulation. Throughout the text, many new worked examples demonstrate how to apply principles of flight mechanics to solve engineering problems. Moreover, the text offers an array of modern and classical techniques for solving a broad range of problems in flight mechanics. Unique features include presentations of the numerical lifting-line method for efficient and accurate evaluation of stability derivatives and the quaternion formulation for six-degree-of-freedom flight simulation. Moreover, the author provides the detail needed to enable readers to write their own code. Mechanics of Flight is designed as a textbook for a two-semester sequence of courses for students in mechanical and aerospace engineering. In addition, the text's self-contained chapters allow instructors to select individual topics for one-semester courses. The book is also a valuable reference for engineers working in the aerospace industry. WARREN F. PHILLIPS, PHD, is a Professor of Mechanical and Aerospace Engineering at Utah State University. Dr. Phillips has more than thirty-five years of experience teaching engineering analysis and design. He has also authored more than sixty scientific journal publications on thermal fluid science, aerodynamics, and flight mechanics. 1.2. Fluid Statics and the Atmosphere. 1.3. The Boundary Layer Concept. 1.5. Review of Elementary Potential Flows. 1.6. Incompressible Flow over Airfoils. 1.7. Trailing-Edge Flaps and Section Flap Effectiveness. 1.8. Incompressible Flow over Finite Wings. 1.9. Flow over Multiple Lifting Surfaces. 1.10. Wing Stall and Maximum Lift Coefficient. 1.11. Wing Aerodynamic Center and Pitching Moment. 2.5. Off-Axis Forces and Moments Developed by a Propeller. 2.6. Turbojet Engines: The Thrust Equation. 2.7. Turbojet Engines: Cycle Analysis. 2.8. The Turbojet Engine with Afterburner. 3.4. Rate of Climb and Power Available. 3.5. Fuel Consumption and Endurance. 3.6. Fuel Consumption and Range. 3.7. Power Failure and Gliding Flight. 3.8. Airspeed, Wing Loading, and Stall. 3.9. The Steady Coordinated Turn. 3.10. Takeoff and Landing Performance. 3.11. Accelerating Climb and Balanced Field Length. 4. Longitudinal Static Stability and Trim. 4.1. Fundamentals of Static Equilibrium and Stability. 4.2. Pitch Stability of a Cambered Wing. 4.3. Simplified Pitch Stability Analysis for a Wing-Tail Combination. 4.4. Stick-Fixed Neutral Point and Static Margin. 4.5. Estimating the Downwash Angle on an Aft Tail. 4.6. Simplified Pitch Stability Analysis for a Wing-Canard Combination. 4.7. Effects of Drag and Vertical Offset. 4.8. Effects of Nonlinearities on the Aerodynamic Center. 4.9. Effect of the Fuselage, Nacelles, and External Stores. 4.10. Contribution of Running Propellers. 4.11. Contribution of Jet Engines. 5. Lateral Static Stability and Trim. 5.2. Yaw Stability and Trim. 5.3. Estimating the Sidewash Gradient on a Vertical Tail. 5.4. Estimating the Lift Slope for a Vertical Tail. 5.5. Effects of Tail Dihedral on Yaw Stability. 5.6. Roll Stability and Dihedral Effect. 5.7. Roll Control and Trim Requirements. 5.8. The Generalized Small-Angle Lateral Trim Requirements. 5.10. Engine Failure and Minimum-Control Airspeed. 5.12. Control Surface Sign Conventions. 6. Aircraft Controls and Maneuverability. 6.1. Longitudinal Control and Maneuverability. 6.2. Effects of Structural Flexibility. 6.3. Control Force and Trim Tabs. 6.4. Stick-Free Neutral and Maneuver Points. 6.5. Ground Effect, Elevator Sizing, and CG Limits. 6.7. Lateral Control and Maneuverability. 6.9. Other Control Surface Configurations. 7. Aircraft Equations of Motion. 7.2. Newton’s Second Law for Rigid-Body Dynamics. 7.3. Position and Orientation: The Euler Angle Formulation. 7.4. Rigid-Body 6-DOF Equations of Motion. 7.5. Linearized Equations of Motion. 7.6. Force and Moment Derivatives. 7.7. Nondimensional Linearized Equations of Motion. 7.8. Transformation of Stability Axes. 7.9. Inertial and Gyroscopic Coupling. 8.1. Fundamentals of Dynamics: Eigenproblems. 8.2. Longitudinal Motion: The Linearized Coupled Equations. 9.2. Lateral Motion: The Linearized Coupled Equations. 10. Aircraft Handling Qualities and Control Response. 10.3. Dynamic Handling Quality Prediction. 10.4. Response to Control Inputs. 10.5. Nonlinear Effects and Longitudinal-Lateral Coupling. 11.5. The Euler-Rodrigues Quaternion Formulation. 11.7. Relations between the Quaternion and Other Attitude Descriptors. 11.8. Applying Rotational Constraints to the Quaternion Formulation. 11.9. Closed-Form Quaternion Solution for Constant Rotation. 11.10. Numerical Integration of the Quaternion Formulation. 11.11. Summary of the Flat-Earth Quaternion Formulation. 11.12. Aircraft Position in Geographic Coordinates. A Standard Atmosphere, SI Units. B Standard Atmosphere, English Units. C Aircraft Moments of Inertia.